By the time Srila Gurudev reaches the bottom of the stairs to his veranda, about fifteen devotees have gathered. The group increases as we continue on our exciting journey to the top of the hill. 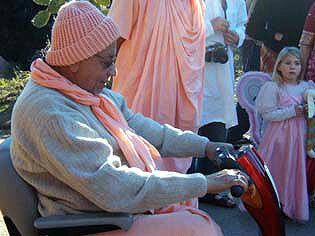 On the way up to entrance of the new road, Srila Gurudev calmly drives his scooter, stopping every once in a while to look at the hillside. On his left is a big grassy mountain lined with oak trees, which provide shelter for the devotees who are staying in tents. Further down the path there is a patch of tall eucalyptus trees that bend dangerously to the ground when there is a lot of wind and rain. It has been extremely rainy and cloudy in the last few days, but this afternoon is sunny and the air revitalizing. In the two months since Srila Gurudev has been in Soquel, he has not seen a deer and is always mentioning if one will come across his path or appear in the distance. Before we built the fence around the orchard, however, there were many deer lingering around the property eating the fruits. You could see them early in the morning and late at night. Now we don't see them as much, but we have a lot more fruit! All of the devotee workers are waiting for Srila Gurudev when we arrive at the base of the road, which is named Via Govinda. One devotee jokes about how Srila Gurudev is going up and we are following him there. This road will take us to Krishna, but only if we follow our dear Gurudeva. Completing the road in just a few weeks, Hasyapriya Prabhu organized all of the helpers to manifest Srila Gurudev's desire. Saki Charan Prabhu and Chinmoy Prabhu didn't stop working until it was finished. Munindra Mohan Prabhu, who was visiting from Italy, joined the project with his sweet, gentle presence. Many other devotees also put their energy into this service. Isvara Prasad Prabhu from Venezuela was an endless supply of dedication and enthusiasim during his short stay in Soquel. Halfway up the road, Srila Gurudev stops to take a rest. He is so mercuful in every aspect of his existence. By asking for this road and by driving up it, he is giving us all a great opportunity to appreciate the beauty and potential of this land and the devotees who stay on it. I never imagined that we would have a road like this, or that His Divine Grace would go to the very top of the mountain! As you get higher you can see the breathtaking expansion of the Ashram grounds. Gurudev leads the way with some assistance from the devotees, for the road is pretty steep in some areas. Behind Him is a snake of devotees and several dogs running to catch up. Everybody laughs, jokes, and exclaims at how quickly the road was built. Even Srila Gurudev tells us he is surprised that we did it so soon after he asked for it. When we reach the top, we see many houses nestled in the thick evergreen trees. After most of us (now a crowd of about 30) are able to catch our breath, Sripad Avadhut Maharaj climbs up, panting and dropping to the ground in full dandavat pranams before His Divine Grace. He has just arrived from a preaching program in Oregon. Srila Gurudev is clearly very happy to see him. Srila Govinda Maharaj stands up, although his body isn't very strong and he has some difficulty walking. With the assistance of several devotees, he walks down the path along the peak and looks at the view. 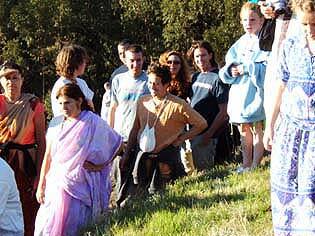 He talks about making a clearing among the bushes for the devotees to have dinner. He says that it would be nice to eat here before the sun goes down. I think it is a splendid idea. Srila Gurudev has so much insight and wisdom to make us happy and give us a chance to do some seva.